White cementitious and flexible tile adhesive, fortified with acrylic resins. 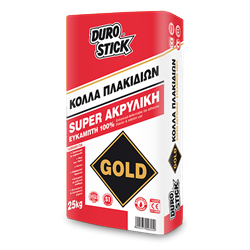 Distinguised for its high adhesive strength, zero vertical slip, and its resistance to moisture and frost. Its high thixotropy allows for applications of up to 15mm without ‘sagging’. It has extended open time. Suitable for the installations of low and non absorbent tiles like granite, glass mosaic, cotto, klinker, porcellanato, smaltato and decorative bricks, both indoors and out . Resistant to intense expansions and contractions of surfaces. Suitable for installations over floor radiant heating systems, athletic and swimming pools, terraces, balconies etc. Classified C2TE S1 per EN 12004 and EN 12002.